FLORAL MEMORIAL TO A LOST TUNE – Sadly one of New York’s most beloved recent attractions has been destroyed. First by taggers, then (supposedly) by the sea itself. 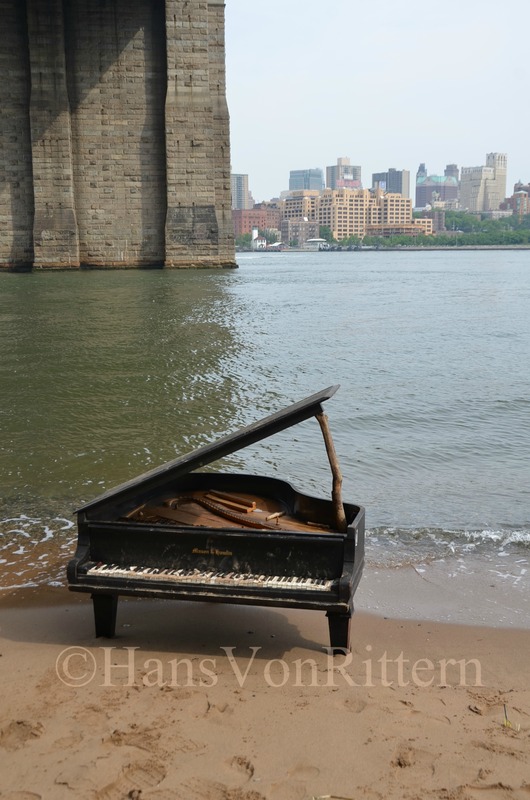 See my post of June 2nd when I discovered the Mason and Hamlin piano there on the shores of our East River/Atlantic Ocean right under the Brooklyn Bridge. It became fodder for every news reporter, tourists loved it and New Yorkers adopted it. The police and harbor patrol looked the other way as people hopped over the gate to be photographed with the piano, the ‘beach’ there is not for public access especially since at high tide the water reaches the West Side Highway. But flock they did, as did I several times. Check out the Internet and you will find some of the most creative and joyful photos taken with it. I did some research myself. The serial number under the key board, 335 26661, according to Mason & Hamlin’s web site, places it around the year 1915. Mason & Hamlin was founded by Henry Mason who was actually a direct descendent of the pilgrims of the Mayflower! As to it’s mysterious origins, a so-called ‘street artist’ named HEK TAD took credit for it. Not until 2 weeks later when he tagged it with his spray painted logo all over it, did he lay claim. If you try to find photos of him, he is this skinny little kid, I sure hope he had plenty-a-help lifting that heavy baby grand over the 30″ gate and onto the beach and that tow truck musta been expen$ive. IF, if he indeed is responsible – he should have just left a sign taking credit, not destroying it’s melancholy beauty with his garish white spray paint markings. Many, including me, sought to paint over the markings and gladly finally someone did with what seemed to be some “oops paint” bought cheaply at hardware stores. One of the last people to be photographed with the piano, is my friend and model Diana Amirova in an early morning photo shoot. I am so glad her beauty did it justice. So finally now this proud 99 year old piano is giving up it’s ghost and surrendering to the mighty sea. When I arrived this past Thursday to check on the piano, someone had left a floral memorial tribute to the beautiful graceful grande treasure from the past. Adieu, farewell, your songs played stay in our hearts. This entry was posted on June 14, 2014 by newyorkcityinthewitofaneye. 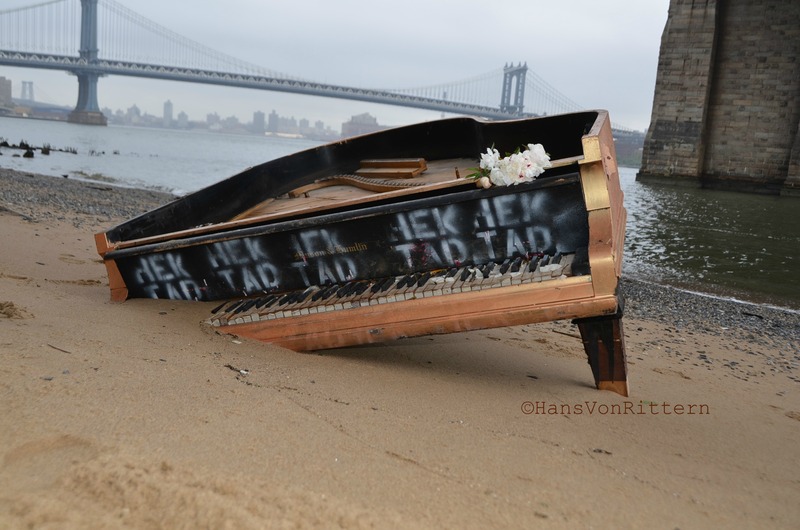 It was filed under DAILY PHOTOS WITH STORIES OF NEW YORK CITY and was tagged with architecture, arts, Brooklyn, Brooklyn Bridge, destruction of piano in East River, Diana Amirova, driftwood, East River, floral tribute to piano, graffiti and piano, Hans Von Rittern, HEK TAD, Henry Mason, Lillian B. Rose, Manhattan, Manhattan Bridge, Manhattan tides, Mason & Hamlin, Mason and Hamlin piano, memorial for piano, model with piano, New York City, New York photo, Photo of the day, photography, piano burried in sand, piano in Atlantic Ocean, piano in East River, piano under Brooklyn Bridge, poet Lillian B. Rose, the Mayflower, West Side Highway.